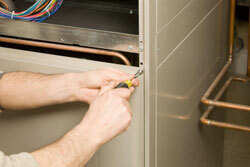 From heating inspections to maintenance and installation, Affordable Comfort can do it all. Get the best for your home’s heating and HVAC — choose Affordable Comfort! As a licensed company with highly skilled HVAC technicians, it’s no surprise that Affordable Comfort is Inland Empire’s choice for heating and cooling. Whether for your home or business, we’ll make sure your heating is working properly. All you have to do is give us a call. Have an emergency or need a job done quickly? Not a problem! Nearly all repairs can be examined and fixed within the same day — our fully stocked vans and efficient team make this possible. If you need additional maintenance or repair services, please visit our Maintenance page for more information or call us toll-free at (800) 774-0182. We are happy to assist you in any way we can. Don’t wait until your heating is on the fritz. Don’t tell yourself it’s fine to wear extra layers and blankets when your house is freezing. Schedule a yearly checkup or repair on your home’s heating today!